Among U.S. government agencies, the adoption of cloud computing hasn’t been moving full steam ahead, to say the least. Even though 2011 saw the Obama administration unveil the cloud-first initiative that called for government agencies to update their old legacy IT systems to the cloud, it hasn’t been the case that these agencies have made great strides in modernizing their infrastructure. In fact, a September 2014 U.S. Government Accountability Office report on federal agencies and cloud computing explained that while several agencies boosted the amount of IT budget cash they spend on cloud services since 2012 (the GAO studied seven agencies in 2012 and followed up on them in 2014), “the overall increase was just 1 percent.” The report stated that the agencies’ small increase in cloud spending compared to their overall budget was due to the fact that they had “legacy investments in operations and maintenance” and were not going to move those over to the cloud unless they were slated to be either replaced or upgraded. But there’s at least a few diamonds in the rough. The CIA recently found a home for its cloud on Amazon Web Services. And, in 2012, NASA contracted out with cloud service broker InfoZen for a five-year project worth $40 million to migrate and maintain NASA’s web infrastructure — including including NASA.gov — to the Amazon cloud. This particular initiative, known as the NASA Web Enterprise Services Technology (WestPrime) contract, was singled out in July 2013 as a successful cloud-migration project in an otherwise scathing NASA Office of Inspector General audit report on NASA’s progress in moving to cloud technology. In August, InfoZen detailed the specifics of its project and claimed it took 22 weeks to migrate 110 NASA websites and applications to the cloud. As a result of the project’s success, the Office of Inspector General recommended that NASA departments use the WestPrime contract or a smilier contract in order to meet policy requirements and move to the cloud. The WestPrime contract primarily deals with NASA’s web applications and doesn’t take into account high-performance computing endeavors like rocket-ship launches, explained Jonathan Davila, the InfoZen cloud architect and DevOps lead who helped with the migration. However, don’t let that lead you to believe that migrating NASA’s web services was a simple endeavor. Just moving NASA’s “flagship portal” of nasa.gov, which contains roughly 150 applications and around 200,000 pages of content, took about 13 weeks to move, said Roopangi Kadakia, a Web Services Executive at NASA. And not only did NASA.gov and its related applications have to get moved, they also had to be upgraded from old technology. NASA was previously using an out-of-support propriety content management system and used InfoZen to help move that over to a “cloudy Drupal open-source system,” she said, which helped modernize the website so it could withstand periods of heavy traffic. “NASA.gov has been one of the top visited places in the world from a visitor perspective,” said Kadakia. 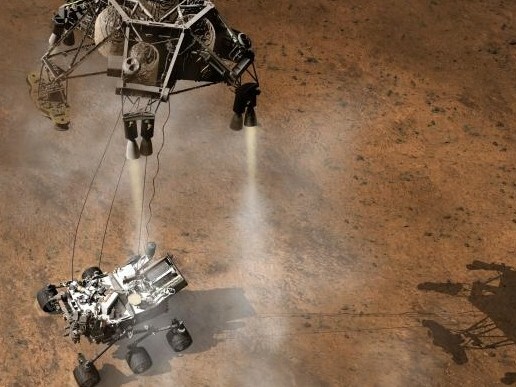 When a big event like the landing of the Mars Rover occurs, NASA can experience traffic that “would match or go above CNN or other large highly traffic sites,” she said. NASA has three cable channels that the agency runs continually on its site, so it wasn’t just looking for a cloud infrastructure that’s tailored to handle only worst-case scenarios; it needed something that can keep up with the media-rich content NASA consistently streams, she said. The space agency uses [company]Amazon[/company] Web Services to provide the backbone for its new Drupal content management system, and has worked out an interesting way to pay for the cloud, explained Kadakia. NASA’s uses a contract vehicle called Solutions for Enterprise-Wide Procurement (SEWP) that functions like a drawdown account between NASA and Amazon. The contract vehicle takes in account that the cost of paying for cloud services can fluctuate based on needs and performance (a site might get a spike in traffic on one day and then have it drop the next day). Kadakia estimates that NASA could end up spending around $700,000 to $1 million for AWS for the year; the agency can put in $1.5 million into the account that can cover any unforeseen costs, and any money not spent can be saved. NASA also had to sift through old applications on its system that were “probably not updated from a tech perspective for seven-to-ten years,” said Kadakia. Some of the older applications’ underlying architecture and security risks weren’t properly documented, so NASA had to do an audit of these applications to “mitigate all critical vulnerabilities,” some of which its users didn’t even know about. After moving those apps, NASA had to define a change-management process for its applications so that each time something got altered or updated, there was documentation to help keep track of the changes. To help with the nitty gritty details of transferring those applications to AWS and setting up new servers, NASA used the Ansible configuration-management tool, said Davila. When InfoZen came, the apps were stored in a co-located data center where they weren’t being managed well, he explained, and many server operating systems weren’t being updated, leaving them vulnerable to security threats. NASA currently has a streamlined devops environment in which spinning up new servers is faster than before, he explained. Whereas it used to take NASA roughly one-to-two hours to load up an application stack, it now takes around ten minutes. What about the rest of the government? Kadakia claimed that moving to the cloud has saved NASA money, especially as the agency cleaned out its system and took a hard look at how old applications were originally set up. The agency is also looking at optimizing its applications to fit in with the more modern approach of coupled-together application development, she explained. This could include updating or developing applications that share the same data sets, which would have previously been a burden, if not impossible, to do. A historical photo of the quad, showing Hangar One in the back before its shell was removed. Photo courtesy of NASA. Larry Sweet, NASA’s CIO, has taken notice of the cloud-migration project’s success and sent a memo to the entire NASA organization urging other NASA properties to consider the WestPrime contract first if they want to move to the cloud, Kadakia said. While it’s clear that NASA’s web services have benefited from being upgraded and moved to the cloud, it still remains hazy how other government agencies will follow suit. David Linthicum, a senior vice president at Cloud Technology Partners and Gigaom analyst, said he believes there isn’t a sense of urgency for these agencies to covert to cloud infrastructure. Much like President Obama appointed an Ebola czar during the Ebola outbreak this fall, there should be a cloud czar who is responsible for overseeing the rejiggering of agency IT systems, he said. Part of the problem stems from the contractors that the government is used to working with. These organizations like [company]Lockheed Martin[/company] and [company]Northrop Grumman[/company] “don’t have cloud talent” and are not particularly suited to guiding agencies looking to move to the cloud. Still, as NASA’s web services and big sites are now part of the cloud, perhaps other agencies will begin taking notice. The old infrastructure was hosted on outdated physical servers which werenâ€™t even under config management, so were usually out of date and difficult to maintain. Moving to any kind of new infrastructure would help with this but where the cloud comes in is when NASA is making a big announcement or streaming live video from its 3 TV stations. Having standby capacity for this would be incredibly inefficient during most of the time itâ€™s not being used. It is good to see such large projects publicly announcing the benefits theyâ€™re getting from moving to public cloud infrastructure, especially for high profile government organisations. In the UK, we are seeing a gradual move of all government web properties and systems move to gov.uk under the management of the Government Digital Service. Contrast with the independent approach of each organisation in the US where outsourcing the work to the private sector seems to be the preferred choice, the UK Government has built an internal department with highly skilled teams to take projects in-house. The effect of these two approaches in actually the same – get efficiencies by using private contractors. In the US they actually use private contractors but the GDS in the UK is acting like a private startup – using the modern technologies, blogging, hiring incredibly talented teams. Separately, g-cloud has also made a huge difference to how cloud technologies are procured, reducing long term contracts and setting standardised processes and definitions. Moving these kinds of workloads to the cloud makes a lot of sense when the infrastructure isnâ€™t efficient to begin with. The advantage of having a centralised department like GDS is you can get even more benefits from the effects of scale with every system combined. The cloud has surprised several industries with its treasure-trove of services. The consensus is that cloud computing will become even more important in the future as it continues to gain traction. Having the right infrastructure in place takes away our concerns about providing a scalable, stable environment that lets us deliver the optimal customer experience. By working with Flux7 to remove this worry, we can better focus on our other business challenges, including trying to market our application. LM doesn’t have cloud talent? Ha!